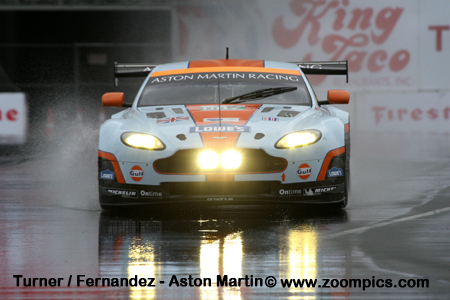 2012 was the fourteenth season of the American Le Mans Series (ALMS). The 2012 ALMS schedule included ten North American events and was similar to the previous year’s calendar with two exceptions. The Mazda Raceway Laguna Seca event was moved from September to May and for the first time, Virginia International Raceway was added to the schedule. The season kicked off with the 60th edition of 12 Hours of Sebring. It was followed by Long Beach, Mazda Raceway Laguna Seca, Lime Rock, Mosport Park, Mid-Ohio, Road America, Baltimore, Virginia International Raceway and the season finale at Road Atlanta. Initially, the ALMS classes and rules were the same as those used by the Automobile Club de l’Ouest at the 24 Hour of Le Mans. Beginning in 2009, changes were made to the classes participating in the series. By 2011, there were five categories competing for class honours. Prototype 1 (P1) – These are purpose built race cars powered by a 6.0-liter normally aspirated or 4.0-liter turbocharged engine. The vehicles can weigh no less than 924-kilograms (approximately 2,040-pounds). Teams enter cars such as the Lola B12/60, HPD AXR-03a and Lola B11/66. The prototype teams can choose from a number of different engine manufacturers. Typically, these motors produce between 600-700 horsepower. Prototype 2 (P2) – LMP675 class was introduced in 2001 for vehicles which could weigh no less than 675-kilograms. In 2004, this became the LMP2 class and the minimum weight was set at 775-kilograms (approximately 1,708-pounds). The rules were written so that the two Prototype categories (P1 and P2) would be contending for the overall win. 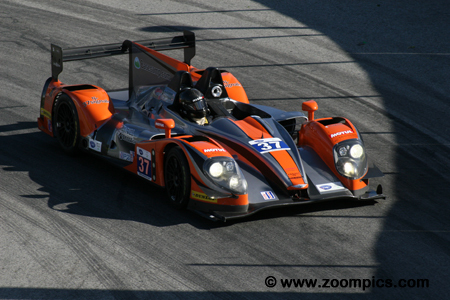 There are cars such as the Morgan LM P2, Lola B11/80 and HPD ARX-03b competing in this class. P2 cars use smaller displacement engines than P1 and produce approximately 500-550 horsepower. Prototype Challenge (PC) – This is a spec class using the ORECA FLM09 chassis. The cars are powered by a Chevrolet LS3 engine which produces approximately 485-horsepower. Grand Touring (GT) – This class includes production based vehicles such as the Chevrolet Corvette C6.R, Porsche GT3RSR, BMW M3, SRT Viper GTS-R, Ferrari 458 Italia and Aston Martin Vantage GTE. The cars are permitted to use 8.0-liter normally aspirated or 4.0-liter turbocharged engines which produce between 600-650 horsepower. These cars can weigh no less than 1,125-kilograms (approximately 2,480-pounds). Grand Touring Challenge (GTC) – In 2009, the GTC class was introduced. This category is a spec class for Porsche GT3 Cup cars. The championships are decided by awarding points to the top ten cars and drivers that completed at least 70-percent of their class winner's distance. To earn points, competitors are required to drive a minimum amount of time (45-minutes except Long Beach which was set at 30-minutes) and a minimum number of laps (dependent on the size of the racetrack). Teams that enter the full season are awarded points towards team championships. The championship winning teams in P1, P2 and GT earn an automatic entry to the 2013 24 Hours of Le Mans. 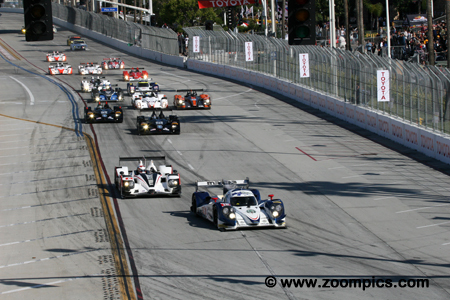 Round two of the 2012 American Le Mans Series was held at the Long Beach Street Circuit. Competitors would race around the eleven-turn 1.968-mile track for two hours in the season’s shortest event. Practice and qualifying were scheduled for Friday 13th. Rain during the morning’s two hour practice session was of little value to the teams and drivers attempting to learn the track and set-up the cars. It went from bad to worse in the afternoon as heavy rain forced the officials to cancel qualifying. The first time competitors drove on a dry track was during the race. Pole-sitter, Guy Smith in the No. 16 Dyson Racing Lola B12/60 won the drag race to the first corner. 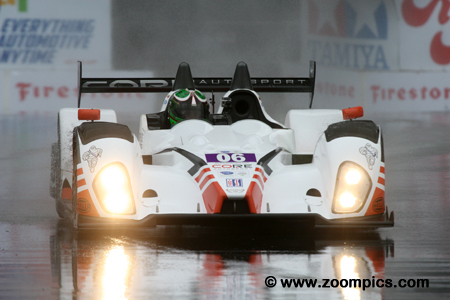 Behind Smith is the second place starter, Lucas Luhr, driving an HPD ARX-03a entered by Muscle Milk Pickett Racing. They are followed by the two HPD ARX-03bs of Level 5 Motorsport and the remainder of the thirty-three car field. 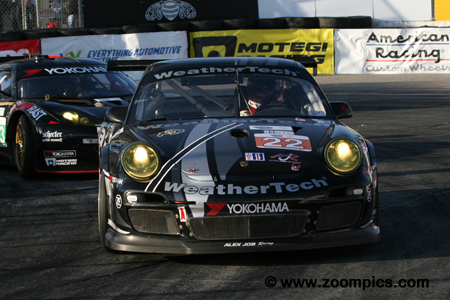 Klaus Graf and Lucas Luhr scored their second consecutive victory a Long Beach. 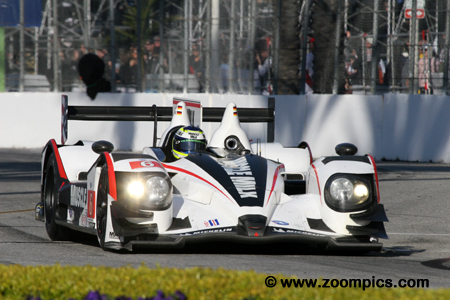 This was the first time an ALMS team were repeat winners at Long Beach. 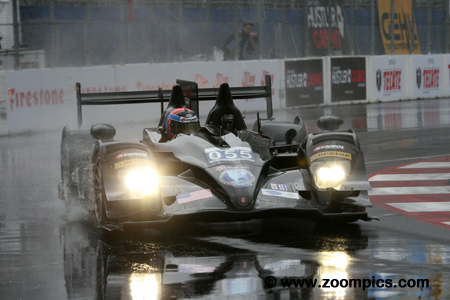 Graf and Luhr drove the Muscle Milk Pickett Racing HPD ARX-03a and started from the second position on the grid. The team stopped twice for fuel during the only caution period of the race. This was the advantage they needed to beat the Dyson Racing entry. The quickest of four Prototype 2 entries was the No. 055 HPR ARX-03b driven by Christophe Bouchut and team owner, Scott Tucker. T ucker drove the first stint and spun early in the race when he was hit from behind. The team decided to run a conservative strategy which required Bouchut to save fuel. The plan worked – they made a single pit stop - the first place Morgan made an additional visit to the pits which allowed the Level 5 Motorsports car to take the class lead and win. Tommy Milner started the No. 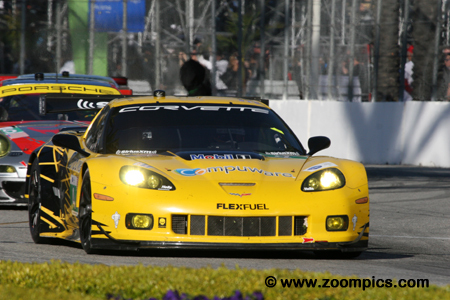 4 Corvette Racing Chevrolet Corvette C6.R third in the Grand Touring category. Milner shared the car with Oliver Gavin who drove the final stint. Gavin was second in class with 46-minutes remaining in the race when he took the lead from the BMW of Dirk Muller. He held on for the win which gave the team its first victory at Long Beach since 2009. Point leaders, Chris Dyson and Guy Smith, started on the pole. The pair was piloting the Dyson Racing Lola B12/60. When the winning HPR ARX-03a entry of Pickett Racing was able to service their car during the caution period – the Dyson team was left at a distinct disadvantage. A green flag pit stop for fuel reduced the chance that Dyson and Smith would take the victory. At the checkered flag, they were second. 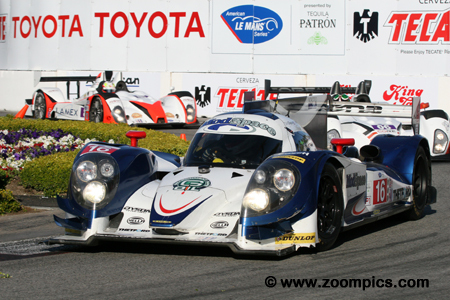 The Conquest Endurance team’s Long Beach race experience was similar to that of Dyson Racing. Driving the Prototype 2, Judd-powered Morgan LM P2 were Martin Plowman and David Hansson. An additional pit-stop late in the race for fuel took the Morgan out of contention and dropped the team to a seventeenth place finish – second in P2 but seven positions behind the class winners. 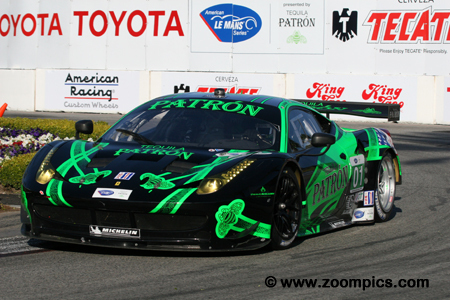 Green Hornet Racing captured their first ALMS Grand Touring Challenge category victory at Long Beach. The No. 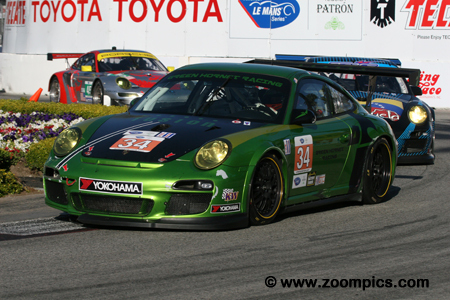 34 Porsche GT3 Cup was driven by Peter LeSaffre and Damien Faulkner. The Porsche started twenty-ninth overall and second in class. LeSaffre started the race and was involved in an incident that damaged the headlights. All lengthy stop was required to make repairs. Faulkner returned to the track in fourth place but fought his way through the field for the GTC win. After being victorious in the season opener at Sebring, CORE Autosport captured their second win of the season. 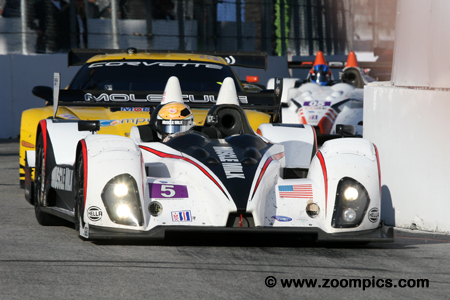 Sharing the Prototype Challenge class Oreca FLM09 were Ryan Dalziel and Venezuelan, Alex Popow. The pair dueled with the Muscle Milk Pickett Racing entry driven by Memo Gidley and Mike Guasch. Dalziel drove the final stint and was able to pull away from Gidley. At the checkered flag, he was victorious by a one lap margin. The No. 22 Alex Job Porsche GT3 Cup was shared by Cooper McNeil and Leh Keen. The car started on the Grand Touring Challenge pole and twenty-eighth overall. McNeil drove the first half of the race. During the races, only caution period the team refueled and put Keen in the Porsche. Keen was challenged and passed Damien Faulkner. He finished second – 3.107-seconds behind the class winner. The Prototype Challenge entry of Muscle Milk Pickett Racing started eleventh overall and fourth in class. Driving the Oreca FLM09 for the first stint was Mike Guasch. Guasch was following the leader Alex Popow when Popow was slowed by another car. He made the pass for first place but the team lost their advantage during a pit-stop. Guasch and his co-driver Memo Gidley would finish second in class and fourth overall. 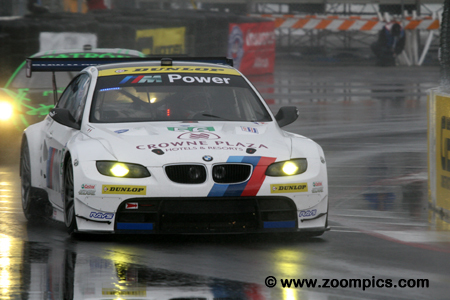 Starting sixteenth overall and first in the Grand Touring category was Joey Hand driving the BMW Team RLL BMW M3. Sharing the No. 56 BMW with Hand was Dirk Muller. As the race moved into the last half, Muller was leading the Corvette driven by Oliver Gavin. Garvin made a successful pass for first place which he did not relinquish. The BMW finished second – 4.258-seconds behind the Corvette. Finishing third in the Grand Touring category was the No. 01 Extreme Speed Motorsports Ferrari F458 Italia. Sharing the driving duties were Scott Sharp and Johannes van Overbeek. Van Overbeek started the Ferrari ninth in class and twenty-fourth overall. Starting as far back in the field as they did, the pair did well to capture the final spot on the GT podium and finish eighth overall.